In my previous post I discussed why the traditional method of measuring loyalty is a lot like how a novice approaches golf. In order to advance your loyalty program and build lasting customer relationships, you don't need to focus on an exhaustive list of KPI’s generated by others’ success. In the master’s class I lead at the recent COLLOQUY Summit, I gave the example of Jim Furyk, a PGA golfer with his own unique style of golf swing that breaks all the traditional rules of best practices. Perfect technique can be both uncomfortable and ineffective. Golfers will make the necessary adjustments to suit their own style. How Jim reaches his point of impact is different from his peers, yet he continues to see exceptional results. 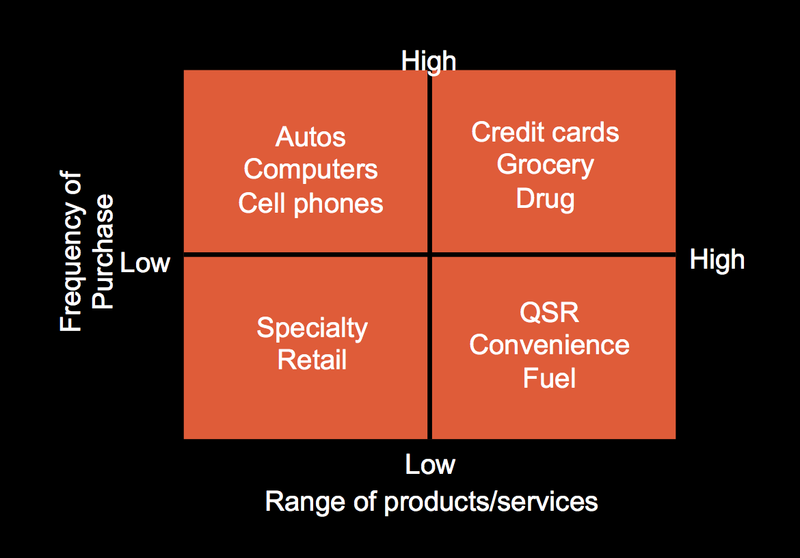 Start with your transaction purchase components and whether they fall within the high or low frequency quadrant category. Understanding key elements surrounding your transactions is the core of what you probably need to deliver to grow your organization's brand and financial outcomes. You’ll see some examples of the types of brands that fit within each quadrant. Don’t take these as givens for two reasons. First, you may find your organization breaks some of the norms and if you just default to a quadrant you’ll probably be giving up opportunities. 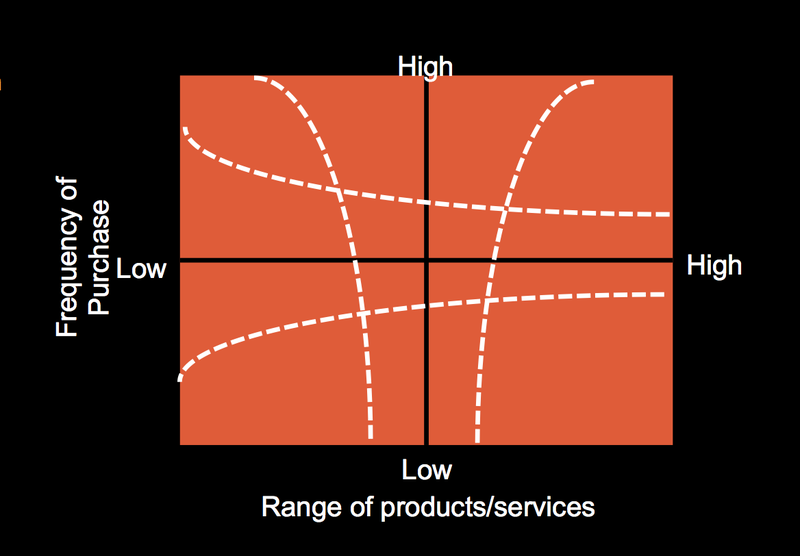 Second, if your plan is to cast a wide net, you may also find that you span more than one quadrant depending on the customer segments, or as in Moneyball, your range of misfits. 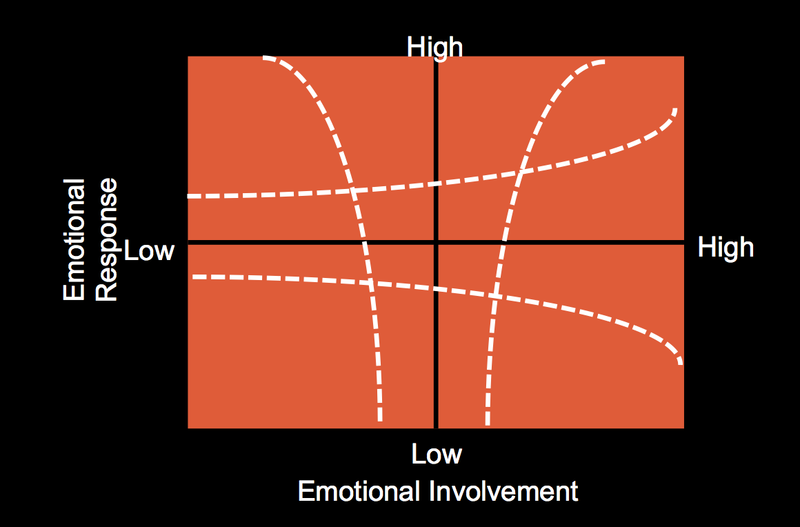 Once you decide on a quadrant, you’ll begin to understand information about how much transactional detail you'll need to have (both over the period of time and the depth of basket information). We found that if your transaction frequencies are high, such as more than once a month, the amount of history you need to access is much shorter than if purchases are very infrequent. And, the more purchases you can get visibility into from partners or third parties, the less history you will need. Generally, the less frequent the purchase frequency and/or the more narrow your product and service offering the more important partner or third party data will be to accelerating your success on just the purchase frequency dimension. For instance, if you are in the fuels category, and you only have a few products or types of fuel. Finally, consider emotional response: Once you understand where you fall in the run production area, you need to understand if there is a need for ‘feel’ to your game. Now we look at the level of emotion involved in your transactions and the level of emotional engagement around your products, services, brand and category. By emotional involvement, we are looking at what does someone want to know or need to know to purchase a product or service from you or within the category. If your category is a high involvement category, providing content such as information about your products, how they work and how your products perform to others becomes more important. And, your overall loyalty strategy and measurement plan will be affected by this. The same thing is similar for emotional response. If response is low, or you are in a boring category like bath tissue, you may want to find a way to create emotion or you may be better to jut default to transaction frequency. And, if you have a product that gets a lot of response and attention, such as autos, computers or fashion, then you need to consider social media, reviews, ratings and other ways for people to express and rally behind your brand. For both of these, their level of importance will vary by segments. Every categories, even toilet paper have raving fans although I suspect their numbers or limited. And, with younger segments or consumers new to your brand or category, they will be looking for information to make their first purchase decision. This may affect what you feel in your swing and you many need to changes things a bit to make solid contact at your moments of impact. The key here is to know your moment of impact and figure out what type of swing you need. This is not a one-size-fits-all approach, or a one-time process. You need to continually fine-tune and enhance your efforts to maximize loyalty.